It has been a whole year since I printed the last newsletter edition. In 2003, Mary and I did a lot of international travel, cutting our domestic schedule for the last half of the year. The Bondodontics seminar even went to China with the first "fee for service" dental seminar. For 2004, we have arranged some of the very finest guest speakers to share the programs with me. The first one, Gary Unterbrink, will be speaking in June at Tahoe and Hawaii. When it comes to bondodontics, I rate Gary "the best of the best". As many of you know, a lot of the recent concepts I have presented have come from Gary. He does not speak in the USA very much, so my very best advice is "don't miss" this opportunity. Besides, the venues are great. The other exciting development is possibly returning to Yosemite. After 20 successful years, we pulled out last year due to a group-unfriendly management policy. We know that a lot of you have been disappointed. Now they have invited us back with what we hope will be more acceptable arrangements. It looks like either the first or second weekend in November will be scheduled. The dates are pending due to unresolved invitations to some world-class guest speakers. There will be some seminars in the UK again in 2004. The 2004 dates are February 20 in Manchester and February 21 in London. Right now, there are $361 roundtrip airfares available from San Francisco to London; my E-fare was booked with United at www.ual.com. Also there is a May series in Australia, one of our favorite travel destinations. In this issue, besides the usual news items, I am printing selected questions I received. n 2004, I will be introducing the HealOzone (CurOzone USA). Although manufactured in the USA, it is not yet approved for sale in the USA (FDA approval is pending). It is approved in Canada (Scican, Toronto) as well as most of Europe (KaVo Germany) . Ozone treatment has been shown to clinically reverse caries in a very large percentage of cases (results vary from 86% to 100% success in various studies). The ozone delivery system is a device that takes in air and produces ozone gas. The ozone is then delivered via a hose into a disposable sterile cup at a concentration of 2,100ppm + or - 10%. The ozone gas is refreshed in this disposable cup at a rate of 615 cc/minute changing the volume of gas inside the cup over 300 times every second. 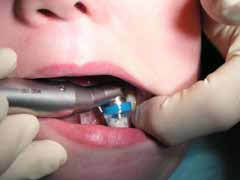 The cup forms a seal around the lesion being treated so that ozone cannot leak into the oral cavity. Around 20-40 seconds of ozone application have been shown to penetrate through carious dentin to eliminate any live bacteria, fungi, and viral contamination. This treatment eliminates the ecological niche of cariogenic organisms as well as priming the tissues for remineralization. The remineralized tooth structure is more resistant to future decay than was the original. In fact no healed areas have been observed to form recurrent caries! Class I incipient lesions where caries reversal will totally eliminate drill and fill, rather a sort of "natural healing". Larger class I lesions where caries, even into the pulp, can be reversed on the inner 3-5 mm. Class V lesions, which are easily accessed, can also be a no-drill situation. Crown margins to reverse margin caries. Sterilization of root canals prior to fill. Surely other applications will follow. I routinely use Panavia to bond ceramic based crowns (e.g., Procera, Inceram), without silane. I am faced with a patient who reacts to Panavia. What is the nature of the bond to ceramic and what do I look for in choosing another material to bond to it? Unfortunately all-ceramic crowns are strongest when bonded. Panavia is a wise choice and you are correct in avoiding silane on the aluminum oxide. Panavia's adhesion monomer bonds directly to the aluminum oxide. (Silane use is a common error. A good reference is: Bonding of glass infiltrated alumina ceramic: Adhesive methods and their durability. Kern M and Thompson VP, J Pros Dent 1995;73:240-249.) So to avoid resin (which presumably causes the patient reaction), I suggest switching to Captek or even better, Graham electroplate, with ceramic. These are super esthetic and can be conventionally cemented with resin-free cements. I have gotten into the habit of using only Starflow for more and more of my posterior fillings. Where are its limitations? I have been using Clearfil SE Bond for some time with better success after your advice to not air dry the 2nd coat, but I am finding that I am getting incidents of sensitivity with it, more so than when using the etch/ Microprime/ Photobond technique. Any reason why? Other than air-drying problems, the only thing that comes to mind is insufficient light curing. Have you checked your light output? I would want at least 600 on the meter for a 10 second cure. The Photo Bond is dual curing so light curing it dosen't matter as much. I know a lot of docs who continue to use the Photo Bond technique you mention, especially now that Starfill 2B is available in an auto-mix cartridge. The 2B is the ideal first increment in that technique. Should I purchase Panavia F or Panavia 21, advantages and disadvantages? Make it Panavia F. The F version can be light cured without use of Oxyguard whereas 21 needs Oxyguard on all margins since it will not light cure. The F version need not be light cured so you have the option of using it just like 21 with the Oxyguard. As I understand it, soon there will be another version of Panavia F, which will light cure with LED lights, a problem right now (except for the LED 5, see below). I need a new light. Should it be an LED? If so, which one? There seems to be tremendous interest in LED curing lights these days. That is understandable: quiet, small, and a nifty look. The problem is that some adhesives and composites lacking the commonly used camphorquinone photo initiator will not cure with most LED lights (example: Panavia F). 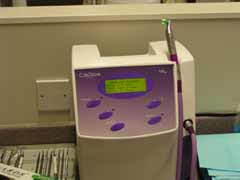 However Ultradent has taken the lead in introducing a LED light (the Lume 5) that cures all known composites and bonds. Ultradent added some separate diodes to take care of the spectrum problem. This is not a cordless light but I certainly prefer a corded light over a cordless one that does not cure everything. The Lume 5 has a sort of hand piece shape and fits nicely into many hand piece holders. Ultradent has some useful accessory tips that are worth looking over. They come with the light. Can I try-in with Panavia F to verify color? I checked with the lab they use Rexillium, acid etch and sandblast. I etched with 37 percent phosphoric gel then I used ED Primer (as I write this I seem to get a flashback to your course about a strong acid followed by a week one), the cement (Panavia 21) stayed on the tooth. Rexillium is a good choice. The Panavia bond to the Rexillium should be about twice as strong as to the enamel. The Panavia stayed on the tooth so there is something terribly wrong with the Rexillium surface. You say "Rexillium, acid etch", if that is electrolytic acid etch in the lab, that is a major lab error. The electrolytic etching removes the "bonding" metals from the alloy. (Such etching was done in the old days, before Panavia, to mechanically retain composites such as Comspan.) The best treatment is just sandblast chairside, after try-in, then place Panavia directly on the sandblasted metal. It is wise to sandblast chairside rather than in a lab, since Danville research, done many years ago, showed a bond strength decrease with time after sandblasting. As you correctly recall, often a strong acid followed by a weak acid makes the weak acid ineffective as an etchant (example: hydrochloric as used in PREMA "microabrasion", then phosphoric). However concerning the specific combination, phosphoric etchant on tooth and then ED Primer, no harm. The enamel bond strength is actually improved compared to just using ED Primer and the Panavia setting is speeded up (see data in recent seminar notes, reprinted below). Presumably the enamel was well etched by the phosphoric acid before the ED Primer was applied. Danville has introduced a new flowable composite, Accolade, to supplement Starflow. They have different flow characteristics. While Starflow is a very high flow composite, Accolade is a sort of "no slump" flowable with sufficient flow to wet bonded surfaces. Along with Accolade's customary Vita shades, Danville has developed a new porcelain veneer bonding system, Accolade PV. The PV designation on Accolade PV refers to porcelain veneer shades dialed-in by yours truly, as opposed to the usual range of Vita shades of Accolade. I think most veneer bonding systems are far too complicated. I only need 3 or 4 shades of the veneer bonding composite, beginning with Translucent and then 2 or 3 more opaque whitish shades. That is exactly what is offered in Accolade PV. In the very unlikely event that I need to darken veneers, a dark Vita shade of any flowable composite would work. I have now seated 12 PV's with Accolade PV. It has the perfect viscosity to feel the veneers go to place, yet it does not slump, tacks in and cures easily. Clean up is easy and fast. Accolade PV is perhaps the easiest material I have ever used for seating PV's. BTW...I am almost out of the Extra Light shade. Can I get some more material? I'm sort of spoiled now. Accolade has wonderful Light and Extra Light shades and a very nice White Opaque. Most of my veneers are seated with Translucent or Light/Extra Light materials. I have never used a shade darker than A-1 or A-2 for delivering veneers, so I really can't comment on the darker shades from any manufacturers. Thanks again for letting me field test a great product. Danville is in the process of developing non-setting try-in pastes due to market demand. Personally I will not use them. I find that I can try in with Accolade PV and have plenty of time to evaluate color. The try-in pastes only introduce the possibility of contamination, something I want to avoid. Before the try-in, I prime the clean, HF etched veneer with silane and then an unfilled resin (supplied with Accolade PV kits), then place Accolade PV on the primed veneer and try-in. After a satisfactory try in, I remove the Accolade PV with a clean brush and replace it with fresh material. I pumice off the tooth with a fairly dry pumice/water mixture then etch. After 20 years experience with porcelain veneers, I can assure you that this procedure works. It save lots of time compared to removing try-in pastes and avoids the possibility of contamination by non-setting try-in materials. My favorite bond for porcelain veneers continues to be Clearfil Photo Bond. I receive frequent E-mails from docs having problems with other bonds and when I switch them over to Photo Bond and Accolade PV or Starflow PV, the problems invariably disappear. Enough said! I continue to recommend "feldspathic" veneers rather than the pressed ceramic veneers. Quite frankly, I think many labs and lecturers recommending pressed ceramic veneers are just commercially driven. The word feldspathic seems to cause confusion; I am referring to the "brush on" porcelains that are baked either on platinum foil or on refractory modeling material. Example porcelains are Ceramco 2, Finesse, d-Sign and Noritake. Historically, many of these porcelains were based on a mineral called feldspar. In my opinion, pressed ceramics should be avoided for veneers. They require too much tooth reduction and never look quite as good as fine feldspathic veneers. Most of my veneers are about 0.5 mm thick. Since thin veneers are a subject of widespread interest, I am putting veneers back into the 2004 programs. I will not be covering veneer basics since it's so well understood. Instead I will show how to successfully complete a tetracycline case with feldspathic veneers, just over 0.5 mm thick (obviously no anesthesia was required since the veneers are in enamel). Ray, H and H works so well that I can't understand why everyone is not using it! Now there is another technique that seems even more ideal than H and H if you do not need to force impression material subgingivaly. This technique eliminates the need for the tricky die spacing required for the H and H impressions. The technique is not new, it is the familiar dual viscosity technique but involves two new impression materials dialed-in by yours truly. I use the same closed bite tray as I use in H and H. (I get my trays from Tin Man Dental 800-554-6394 or www.tinmandental.com). The dialed-in impression materials are Danville's First Half, Light and Heavy. The Light has an innovative black color, to contrast with everything. The color makes margin reading the best ever. The Heavy is rather high in viscosity, forcing the hydrophilic Light into all areas (but not subgingival as well as does H and H). The set time of First Half is about 30 seconds longer than for Danville's First Quarter. The extra time makes the dual viscosity technique very easy. There is another Danville impression material system worth mentioning for its uniqueness. The system was made to the clinical specifications of Dr. John Kois. He wanted a super "runny" light body and an ultra high viscosity heavy tray material. The materials that resulted are called Star VPS Ultralight and Ultraheavy. As in the two above techniques, the heavy body pushes the light body material. Dr. Kois usually uses retraction string and his proprietary hemostatic agent to expose the margins for the runny material. Since the working time and set time is a lot longer than for the other materials mentioned, the Ultraheavy can be higher in viscosity than permitted for faster setting materials. It takes extra time to dispense heavy bodied materials. The Ultralight is at the technical limit of low viscosity. I don't know of a more runny material. I compared it to a popular brand labeled "XLV", presumably meaning xtra low viscosity; well, it wasn't even close. If you want runny, Danville's Ultralight is it! Regarding impression putty, it is not used very much in America but perhaps it should be. Putty is a lot cheaper than the syringe delivered materials. I like Danville's putty because it does not stick to my Travenol latex gloves when I mix it. Additionally the glove powder does not seem to affect its set. My technique is classic putty/wash where the putty is pre-polymerized.